If you’re like me you struggled this week-end with the frost on your windows. It comes down to the fact that the wind chill was 30 below. I even had frost on my front door knob! I couldn’t believe it. There is a certain amount of frost that is considered normal-then it also depends on who you talk to. I am self have an increasingly lower tolerance for the frost especially when I see it’s on the stop (the wood frame) and not the sash (the glass). The reason that it’s a problem is that when the frost melts to drips down between the sash and the stop and then it re-freezes. 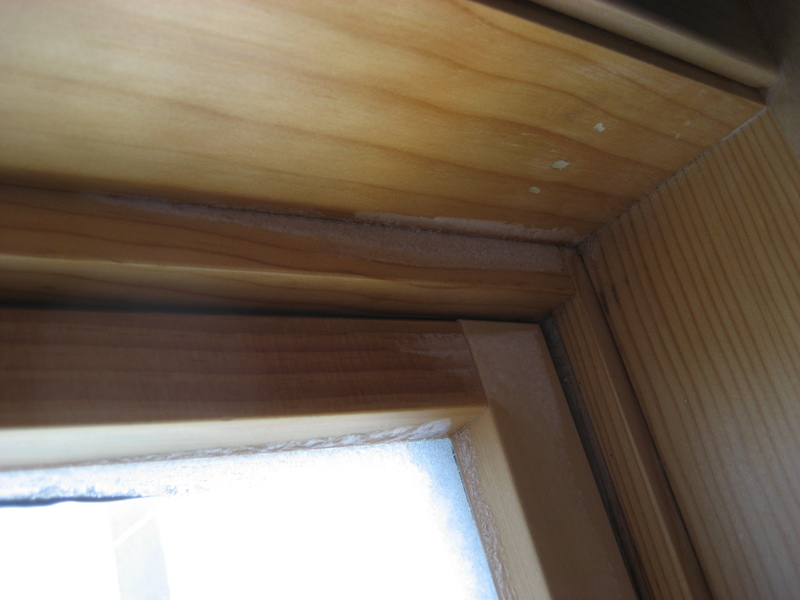 As it builds up it continues to push the sash away from the stop and the window no longer has a tight seal. Check out where the locking mechanisms are on your hinged windows. If you have multiple locks then you’re window is sealed tightly if you only have one then you might have some frost. 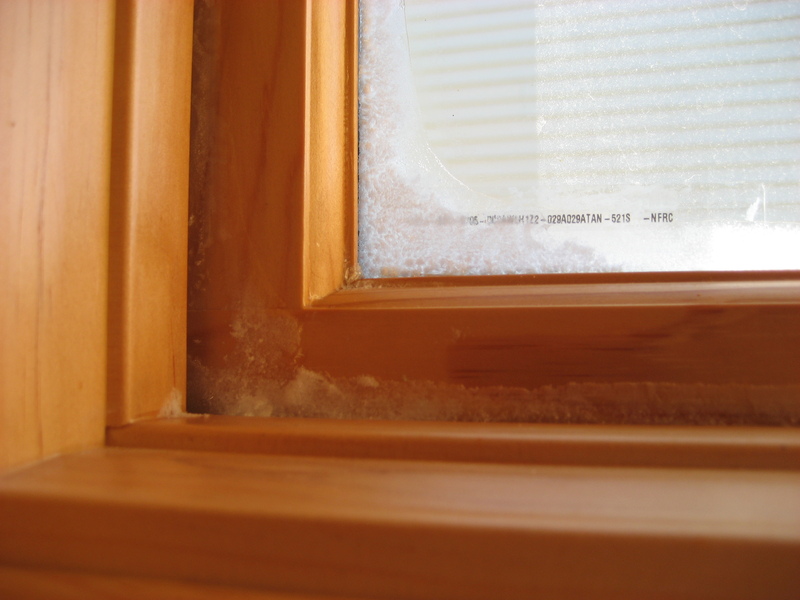 You probably have noticed that your windows that face south don’t have nearly the amount of frost issues. Some of my windows get hit with the northwest wind and that just adds to the problem. What are you going to do, I can’t control the weather? My best advice is to wipe the frost as it melts, turn your humidity down, or if you don’t have a humidifier you can run your furnace fan all the time. The furnace fan will keep the air circulating throughout your house and help reduce excess amount of humidity. It won’t cost you a huge pile of money either because it keeps recirculating the warm air. Don’t forget to pull your shades up in the morning-it’s really important to keep the air circulating on the glass. Essentially it comes down to a decision, if you lower your humidity you will reduce the condensation and the frost on your windows but then all the wood in your home will shrink more. I choose to allow the wood floor to shrink just a little more then I normally would. Visit Pella’s Maintenance Tips manual and on page 7.4 you’ll find a handy chart for humidity control. This article from Real Simple Magazine has some good tips on whether you can do the home improvement yourself or if you should leave it to a pro. It’s a real quick read and a great site. If you are going to do the job yourself ‘measure twice and cut once.’ Always call the electrical company before you dig. http://www.latimes.com/business/la-fi-perfin13jan13,1,6247916,full.column?ctrack=2&cset=true I found this in the Star Tribune from L.A. Time writer Kathy Kristof. She has some great tips to help avoid a home disaster. Like a grease fire in the kitchen or water leaking from the washing machine. The first of many…posts or cold days? Welcome to the Schmidt Homes weblog! We are entering a spell of cold weather and with that comes window condensation. I have noticed some on my windows in the past week. These are a few of my tricks to keep it to a minimum. 1. If you do have condensation on your windows wipe it up! Don’t let that water sit there. It will cause of world of problems down the road-even if you have vinyl windows. 2. Your shades/curtains block airflow-keep them slightly open to allow the air to move across the glass. 3. Keep your humidity levels in your home low. In the winter your humidity should average around 30%. The more humidity you have inside the more condensation you will have on the windows. With lower humidity in your home the wood floor will shrink and you might have more gaps between the boards. Ascetically annoying but it’s structurally sound. 4. If your humidity is too high-start by turning down your humidifier. If that still doesn’t work you can turn on your air exchanger. That will bring in cold air from outside and send the warm air out. The drawback is that you’re heating the new air that comes in the home. I would only do this in extreme situations. This is just a starting point for controlling your humidity levels. For more resources check out home-smart.org.